I think the lack of posting regularity speaks to the fact that I’ve been preoccupied with other things in my life – apologies! I have such a backlog of entries I want to publish but haven’t gotten around to. On a different note, I got an e-mail from a reader who remarked that I eat well for a college student… I’m absolutely flattered, but one of these days I’ll show you what I actually eat on a regular basis; it’ll be a whole post of lazy stir-fries, pasta, and peanut butter sandwiches (sometimes with bananas, sometimes without bread. You heard me correctly). I sympathize completely; in fact, I’m writing this post as an outlet because, like everyone else, I’m feelin’ the pressure. Right now it’s like everyone’s on edge, looking at each other’s work and freaking about how much more they have to do before their own resume or portfolio is ready. But a lesson I’ve learned (and forgotten, and am constantly re-learning) is that my value and my worth aren’t derived from my resume, what I do, or even what I say. As Immanuel Kant would say, my value is inherent in who I am. I think this is something we easily forget when we get caught up in our work and projects; the feeling of inadequacy always kind of finds its way in when we observe the incredible things that others do. But our own work isn’t diminished because of someone else’s; it’s not like awesomeness is finite and someone else is using up a portion that could’ve been yours. What you create, who you are, what you will become – these are all things that have their own intrinsic value. It’s ok to look at and be inspired by the amazing work that others may do, but it shouldn’t negate the value of your own. I hope what I’m saying is true – I want to believe it is. 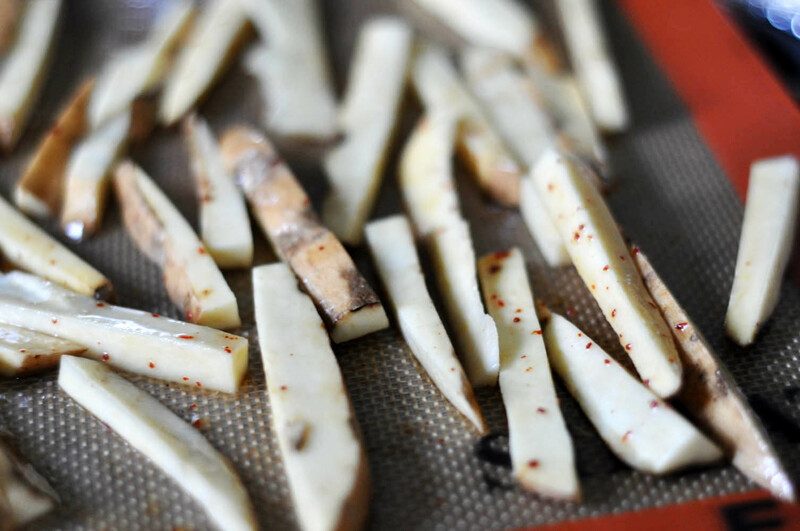 I was going to write that maybe you should take what I say with a grain of salt, but instead I think you should use it for these sweet potato fries (a tenuous connection, I know). Sesame and sweet potato is my new favorite flavor combination: unexpected, but delicious. 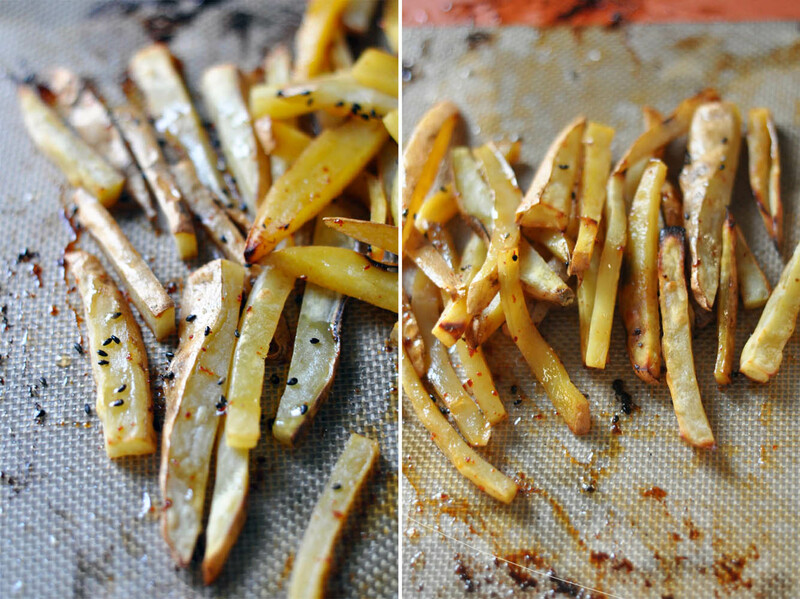 And with the kick from the pepper flakes and a little salt, these fries are really quite extraordinary. 1. 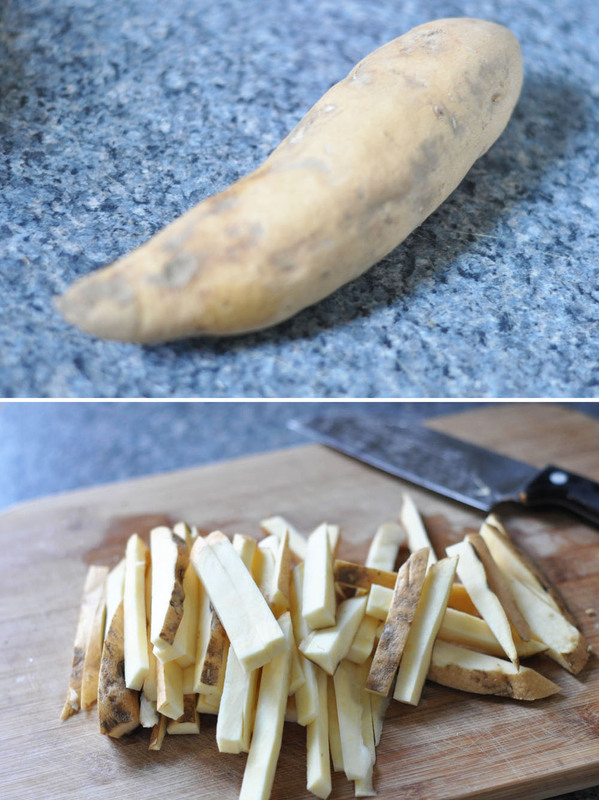 Take your sweet potato(es) of choice and slice ’em into fry shapes (peel the skin off beforehand if you like). 2. Assemble your crew. 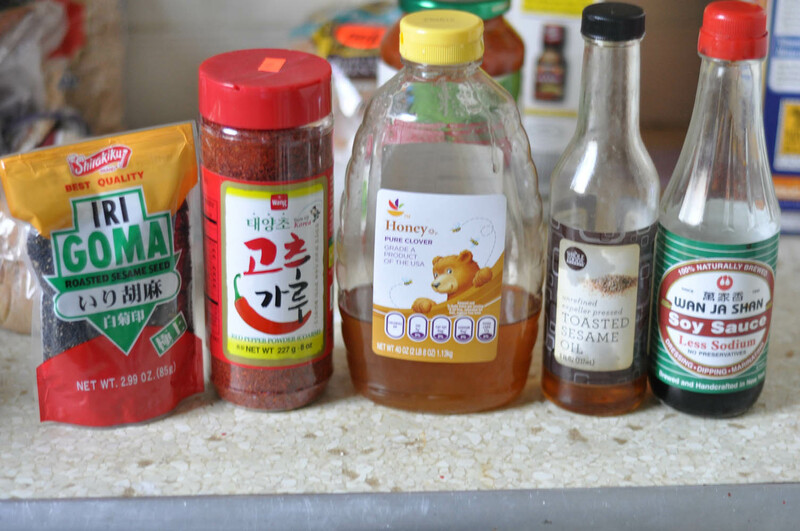 Mix up everything except for the honey and sesame seeds. it kind of looks like this. 4. Bake at 425 degrees F for 30 minutes, or until desired doneness. 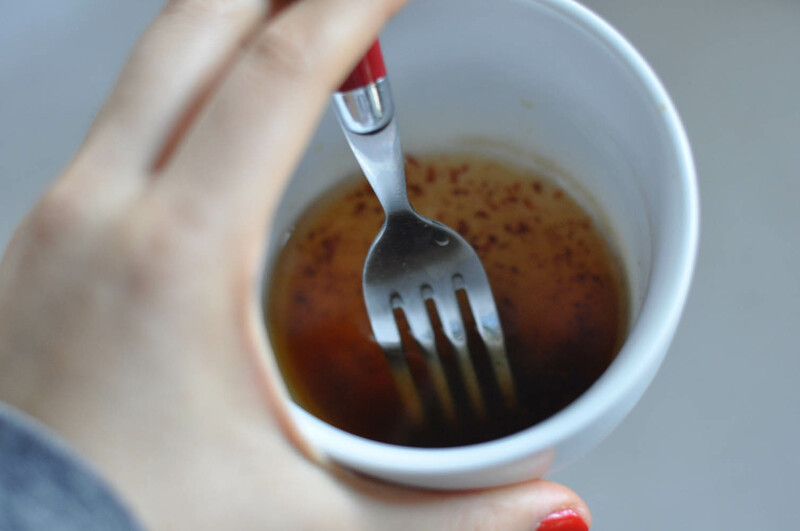 Remove and let it cool for a few minutes; drizzle with honey and coat in black sesame seeds. 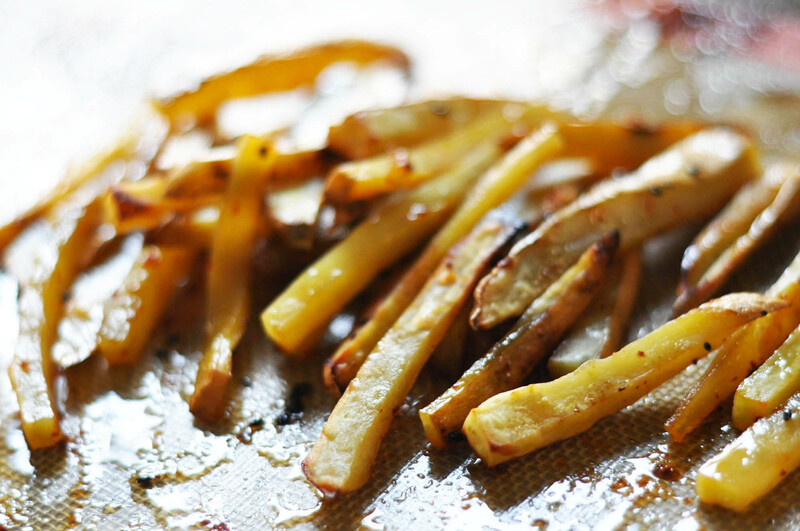 my favorite fries are the little ones that get extra crispy and crunchy. 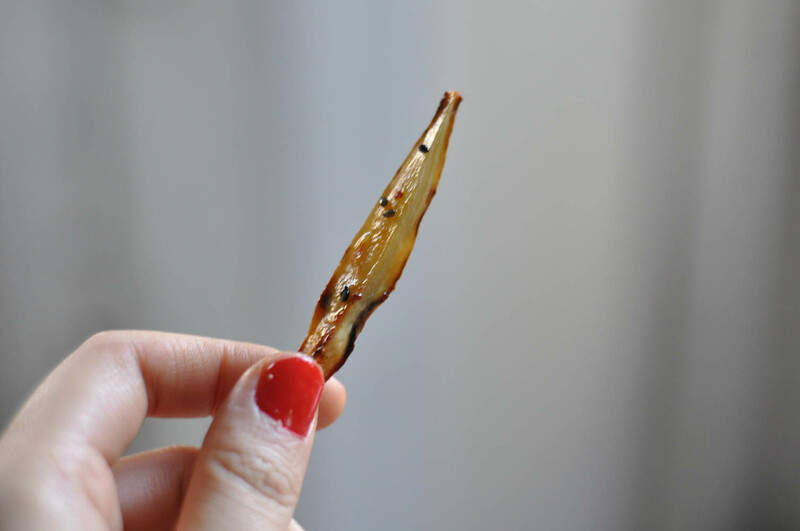 A few days ago I had the ‘real thing’ (deep-fried sweet potato fries coated in corn syrup and sesame seeds) and I have to admit that I prefer these – they’re more subtle, and have the sweet-spicy-salty interplay going on. But if you’re not a fan of the spices I’ve chosen, no worries! The flavor combinations are truly endless; use whatever’s in your pantry, or just straight up salt and pepper. You can’t go wrong!